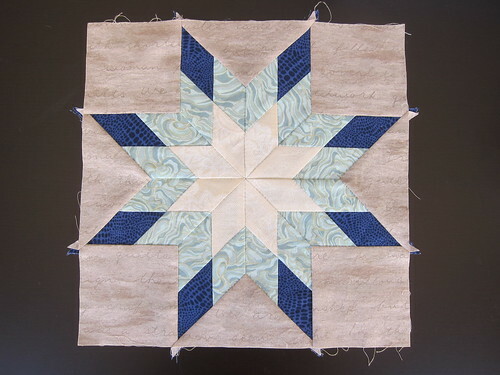 Many moons ago, I took a class at the Workroom to make a gorgeous hand pieced star sampler quilt. 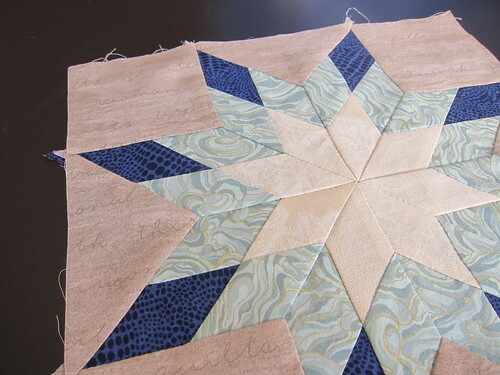 By the end of the class, I had finished the first block (a Lemoyne Star) and had made a pile of tiny pieces. After many months of hand sewing while travelling and while watching TV, I managed to finish my second block last weekend on my way back from a weekend trip to NYC. The second block is a Lone Star block. The center pieces are leftover pieces of background fabric from my Swoon Quilt, the green fabric is an unknown mint metallic print and the blue is an Indigo Blue Snakeskin Dear Stella print I've had in my stash for eons. 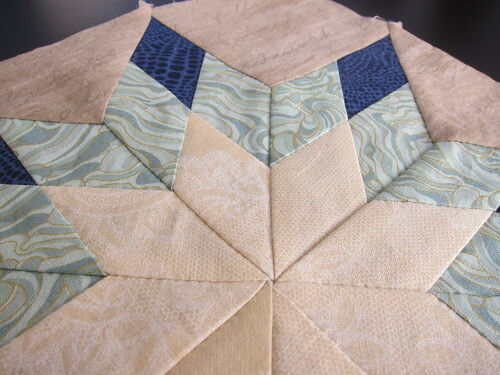 The colour palette that I am using for this quilt is a combination of aqua, yellow, cream, and navy. I chose colours that were pretty far outside of my comfort zone in the hopes that they were classic enough that I'd still like the quilt by the time I got it finished (sometime in the next 10 years or so). I really love the simple portability of a handwork projects and the precision that can be achieved by carefully marking your pieces as you cut. I would have really struggled to match up seams in the same way with a machine. 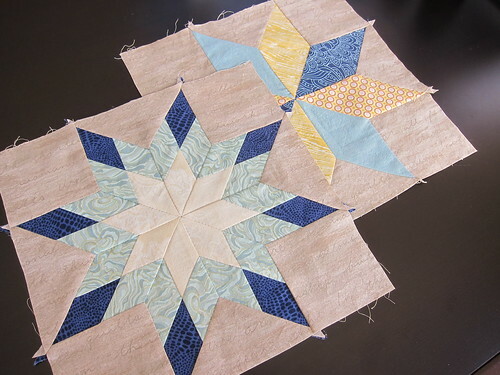 The longer I work on this project, the more I want to increase the size of the quilt and design another 6 blocks. I've even started sketching out a few ideas. I should probably finish the blocks I've started before I actually commit. Then again, that's never stopped me before. I`ve yet to journey over to the Workroom, but i`ve been thinking about signing up for whatever Lizzy House is doing this year. 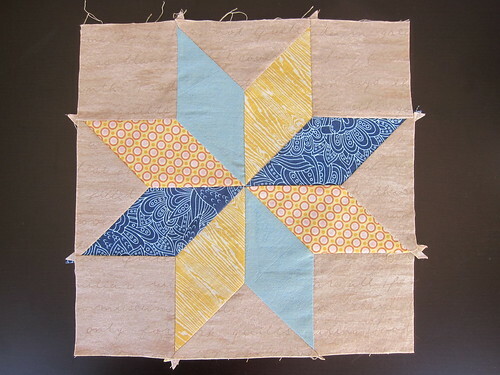 I`m hoping for her Meadow Quilt!! Looking really nice. It's always nice to have a portable project on the go. I have just started a Cathedral window quilt (long term) to have as my potable project.